Huss Park Attractions GmbH, the well-known German amusement ride manufacturer, has announced the re-launch of another successful HUSS® classic ride, the Enterprise, with a new and improved design. The attraction has been re-launched, giving one of the most famous and successful of HUSS® attractions a complete ‘makeover’ and a new lease of life. The ride will be available as Enterprise 2G (2nd Generation), Enterprise 2GH (2nd Generation Hybrid - a combination of suspended seats and classic style gondolas) and as Enterprise 2GH-Plus (2nd Generation Hybrid combined with a new tilt action). The Enterprise has been a hugely popular attraction with both operators and riders for many years, having been in operation since it was originally introduced in the 1970s. With its unique ride patterns and design and its high capacity, it is one of the most successful rides under the HUSS® brand, with more than 75 examples having been sold worldwide – with almost all of these still in operation, a clear indication of the extremely high reliability and durability of HUSS® attractions. As was the case with the HUSS® Condor, which was recently successfully re-launched as the Condor 2G (2nd Generation), the company has decided that in view of the past success of the Enterprise the ride should now be refreshed with a new design and brought back into the company’s active portfolio of rides as the Enterprise 2GH (2nd Generation Hybrid). A new design utilising a hybrid seating arrangement featuring a combination of both the classic style gondolas and new suspended seats has therefore been introduced to create a new experience suitable for a wider range of guests. The Enterprise features a lifting arm which pivots up to 90°. 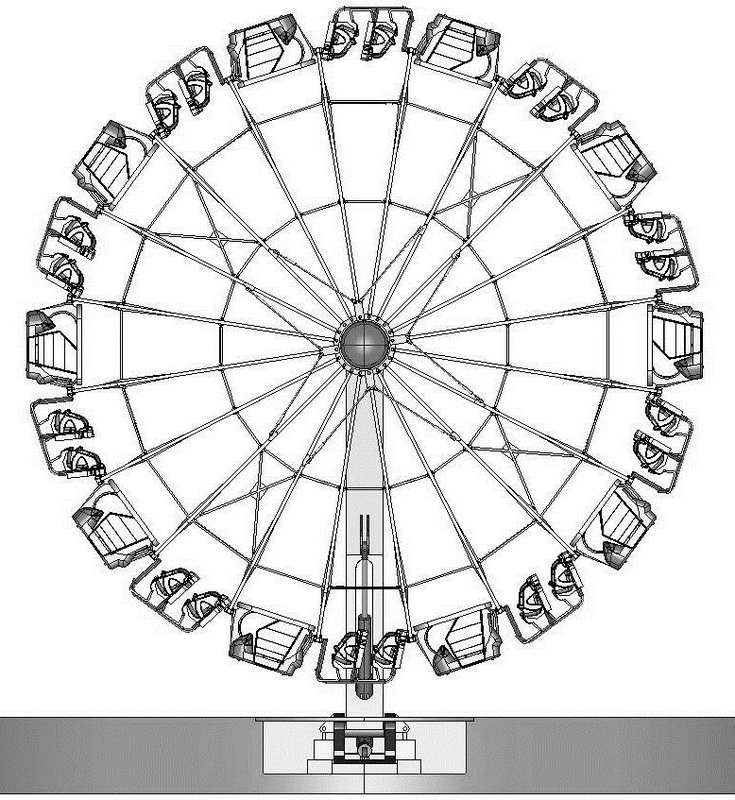 The ride’s wheel disc is driven by a motor and rotates fast enough to allow the gondolas to swing out as it rotates. In the vertical position guests experience a permanent looping ride, at which point the gondolas reach a height of approximately 18m. An acceleration of up to 2.5g is experienced by riders. Both the traditional gondolas and the new suspended seat gondolas accommodate two passengers each, but each provides a very different experience. The enclosed gondola is suited to all kinds of guests, including adults with younger children, while the new, individual suspended seats – positioned one behind the other – provide a more open, thrilling experience. Access in and out of each style of gondola is quick and easy and as an option, the Enterprise 2GH can also be supplied with all suspended seats. A further option is the Enterprise 2GH-Plus, the same attraction but with an upgrade to provide a new tilt action. On this version, the wheel disc can be moved from the upright vertical position, the familiar Enterprise motion, into a horizontal position and/or vice versa, providing a totally new experience. Alternatively the wheel disc can be maintained in a horizontal position while the lifting arm is raised to the upright position. 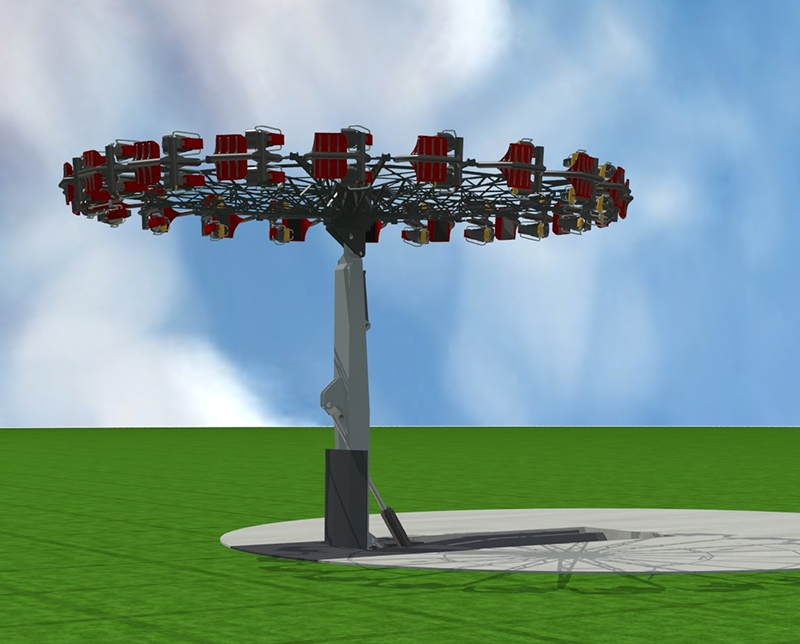 If used in this position at medium or low rotational speed, the attraction can also be operated as a form of panoramic ride. The maximum passenger capacity is 40, leading to theoretical hourly capacities of 1,200 guests. The rotating wheel and gondolas are also ideally suited to a variety of different themes as well as a range of illumination concepts, all of which are available as additional options on the Enterprise. The decision by Huss Park Attractions GmbH to re-launch the Enterprise comes on the back of the successful launch of the Condor 2G in 2013, the revamped version of the well-known Condor, of which 30 examples were sold during the 1980s and 90s. With two such attractions delivered to date (to China), the company is now working on the first Condor 2GH (2nd Generation Hybrid) which incorporates a newly designed hybrid seating arrangement, a combination of suspended seats and classic style gondolas. This particular model has already been sold to a European client and is due to open in 2016. The Enterprise 2G comes with a new and improved seat design. The lifting arm of Enterprise 2GH pivots up to 90°. 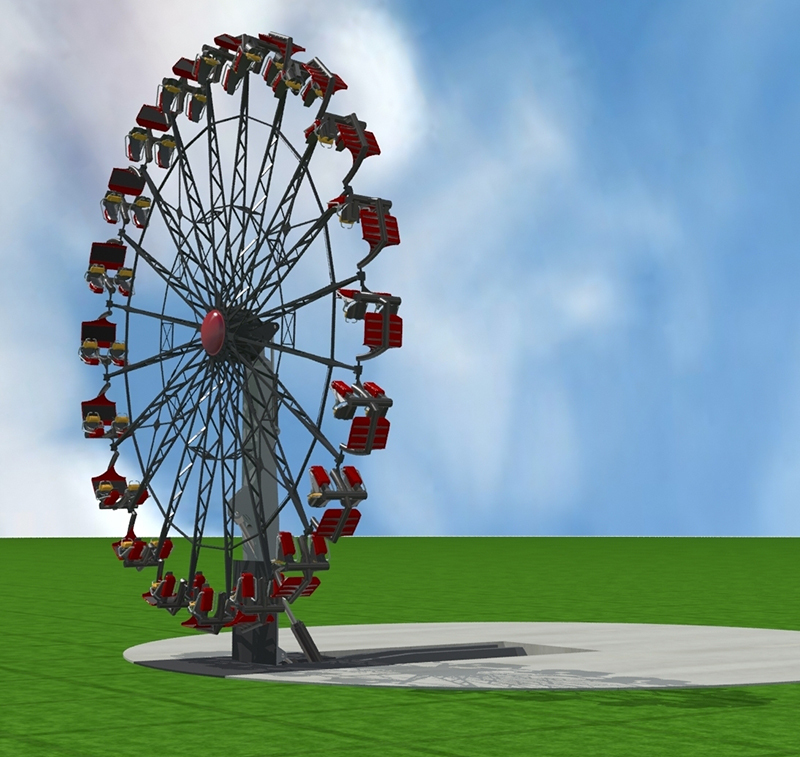 In the vertical position of the wheel guests experience a permanent looping ride. The wheel is perfectly suited for elaborate theming. The upgraded tilt option of Enterprise 2GH-Plus moves the wheel into a horizontal position. 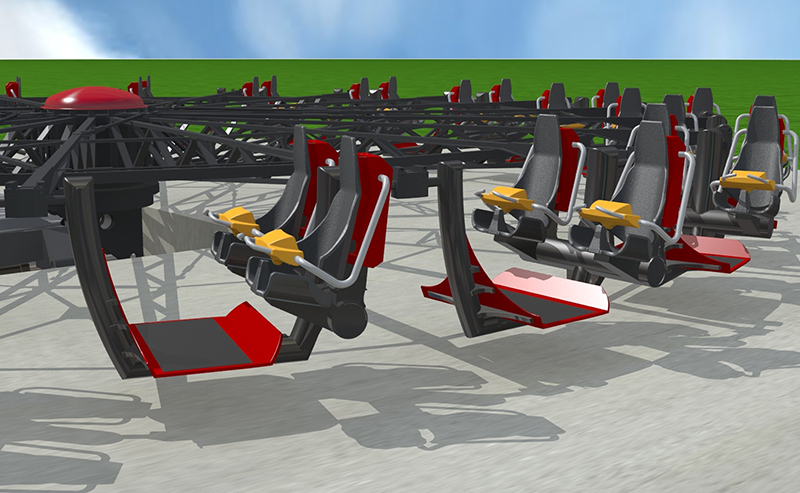 The attraction can also be operated as a form of panoramic ride. The famous HUSS® Enterprise has been brought back into the active portfolio as Enterprise 2GH - 2nd Generation Hybrid. The combination of classic style gondolas and suspended seats gondolas provides different ride experiences in one ride.